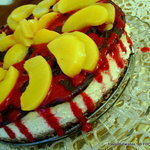 This is a print preview of "Chocolate Raspberry Peach CHEESECAKE" recipe. or return back to Chocolate Raspberry Peach CHEESECAKE. Deliciously indulgent classic 'New York style' inspired creamy Cheesecake. A draped Chocolate 'Ganache' gave into pockets lulling a Raspberry ‘coulis‘. Sweet 'Mediterranean' Peaches capped the ceiling of this decadent cheesecake.
. Prepare a 9 inch (23cm / 2.5 Litre) spring form pan. With a little vegetable oil...grease the bottom and sides of the cake pan. Pre-heat oven to 350F/180C/Gas 4...position oven rack in the center. NOTE: Oven temperature will later be lowered to 325F/ 160C/Gas 3. Optional--Preparing the 'WATER BATH' (Bain Marie) to leak proof your pan: Foil wrap the spring form pan. Cut out an 18 inch (46cm) square piece. Raise it on the sides and then crush the foil at the top as it surpasses the edges a bit. Note: If foil is not heavy duty...double wrap just to ensure a tight leak-proof bake.
. CRUST: In a bowl, toss the crumbs and the coconut with the melted butter until a moistness is realized. Press evenly at the bottom of the pan. BAKE for about 10-12 minutes or until firm to the touch. Cool completely at room temperature. Set aside. LOWER the oven temperature to 325F/160C/Gas3.
. FILLING: In a large bowl, beat the cheese with the sugar on MEDIUM speed. Combine until smooth. Gradually add the eggs one at the time while beating on very low. Add the vanilla extract, lemon juice and sour cream. Slowly beat until smoothly combined. Don't over beat. Pour the batter into the prepared crust.
. BAKING: Note: If using a' Water Bath' method...add the foiled cake pan and fill the roasting pan of hot tap water by bringing it halfway up the sides of the pan. However, if not using a 'water bath'...make sure to at least place the cake pan onto a baking sheet. BAKE for 90 minutes. With the OVEN turned OFF: Leave everything alone for 1 more hour. Afterwards, open the oven door slightly ajar to let the rest of the heat and steam escape. Later, when oven is no longer warm (about 1 hour)...transfer cake pan to a wire rack. Once it's completely cooled, cover with plastic wrap and place it into the refrigerator. It will be ready to decorate in about 4 hours or longer.
. > ASSEMBLY: Place the cake pan on a serving dish. Run a wet thin metal spatula or knife around the sides of the pan and then loosen the spring form clip to release the cake. This cheesecake should be eaten in the next few days or properly plastic and foil wrapped for freezing up to one month.
. > TOPPINGS: . CHOCOLATE ' ganache' spread: In a small-medium bowl pour the milk and the coarsely chopped chocolate and milk together. Place bowl in a bain-Marie and slowly melt the chocolate while stirring once and a while til smooth. Add the butter and syrup. Stir and set it aside until cooled enough, yet spreadable. RASPBERRY 'coulis': In a blender, puree together the reserved peach syrup and raspberries. Set aside. PEACHES: Drain and slice the fruit in thick pieces and set aside.
. > DECORATION: Pour and spread the chocolate 'ganache' throughout the surface of the cake. Through a thin sieve...puree the raspberries and pour over the cake while having it slightly drape over the sides. Quickly decorate the complete surface with sliced peaches before the chocolate sets and hardens. The covered fruit topping will remain looking fresh for at least 2 days.